Dang! It's been so long and I think I was just awoke from another long slumber. I think I was trying to figure out how I can find more inspiration of writing more posts without being repetitive. In most cases, it flow fast out like a gush of water for a ride on Raging Waters. Other times it can be dormant like the past 4 months. Luckily for today, I decided to make some trips down to downtown LA. I think was doing some weird errands and was planning to check out a restaurant nearby (Orsa & Winstons perhaps?). Then on a peak of my eyes, I saw a small take out place with a few tables in an arcade mall. 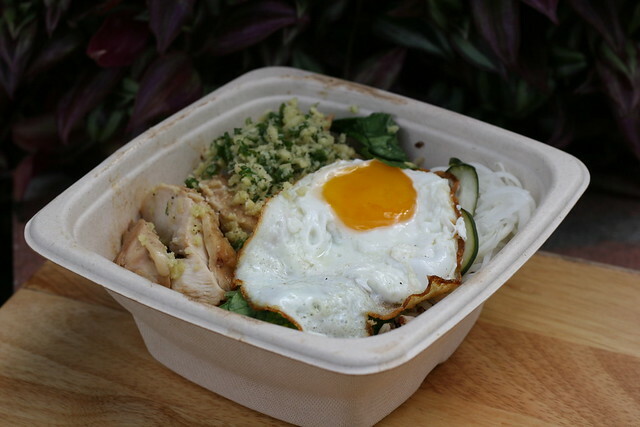 RiceBox is similar to what you find on a Cantonese BBQ place that serves a bevy of different meat proteins that prepares in Cantonese roasted style. Probably the most famous is the Char Siu, where the pork or any meat is roasted on a long fork over a fire oven. There is also ingredient of sauce embedded on the meat to give that succulent taste and flavor. While I was looking over the menu, I also happened to stumble upon the soy sauce chicken with bok choy that it was offered. Adding a fried egg on top seemed to be a bit bougie, but without a tea egg or hard boiled, I thought it would be suffice. While I was there, I might as well get their version of the "OG Char Siu Pork", which I gathered was honey glazed with the aroma of sweet smell from the slow cooked method. Now of course, what makes me wanting to go to this nondescript place in middle of downtown for Chinese food? The place have a cute little tables set up for dine-in, but with a tight place like this, it probably managed a dozen people for the capacity. I highly support a place like this instead of glorified take out place that doesn't do justice. For me, I had a good impression on a take on Cantonese BBQ in the middle of an area that seemed bustling with hip taco joints and divey bar actions. This bougie Chinese bento is a welcome sight. In a perfect world, this would be my kind of Chinese take out or delivery places. 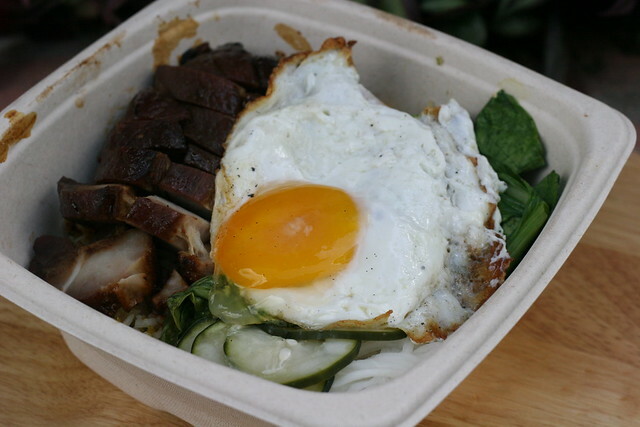 Love how they prep and present the rice bowl of either the succulent char siu pork or the soy sauce chicken. Be prepared though to find parking. This place is great for that take out meals if you live around that area, but rough for destination travel meal. Hope they decide to open late for that late night snoosh after the last call. That to me would be perfect.